We initiate the first systematic study of the NP-hard Cluster Vertex Deletion (CVD) problem (unweighted and weighted) in terms of fixed-parameter algorithmics. In the unweighted case, one searches for a minimum number of vertex deletions to transform a graph into a collection of disjoint cliques. The parameter is the number of vertex deletions. We present efficient fixed-parameter algorithms for CVD applying the fairly new iterative compression technique. Moreover, we study the variant of CVD where the maximum number of cliques to be generated is prespecified. Here, we exploit connections to fixed-parameter algorithms for (weighted) Vertex Cover. 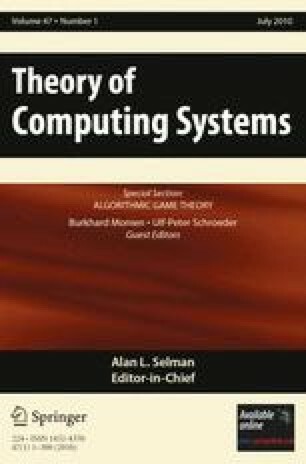 An extended abstract of this paper appeared in Proceedings of the 8th Latin American Theoretical Informatics Symposium (LATIN 2008), April 7–11, 2008, Armação dos Búzios, Brazil, volume 4957 in Lecture Notes in Computer Science, pp. 711–722, Springer, 2008. The research of F. Hüffner was supported by the Deutsche Forschungsgemeinschaft, Emmy Noether research group PIAF (fixed-parameter algorithms), NI 369/4, and the Edmond J. Safra foundation. The research of C. Komusiewicz was supported by a Ph.D. fellowship of the Carl-Zeiss-Stiftung. The research of H. Moser was supported by the Deutsche Forschungsgemeinschaft, project ITKO (iterative compression for solving hard network problems), NI 369/5, and project AREG (algorithms for generating quasi-regular structures in graphs), NI 369/9.